Holocaust Survivors: Photo Gallery - "Execution of Polish POW's"
Execution of Polish POW's near Ciepielow in September 1939. Here some of the 300 Polish prisoners-of-war who were executed by firing squad are visible. 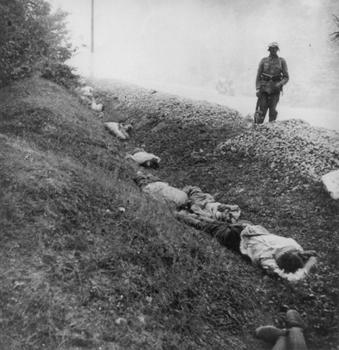 In the background is a Wehrmacht soldier who participated in the killing.